Tooth sensitivity starts when the protective layer of your teeth (formally known as tooth enamel) starts to thin. The insides of your teeth including the tooth root and nerves are supposed to be protected by the outer layers of your teeth. 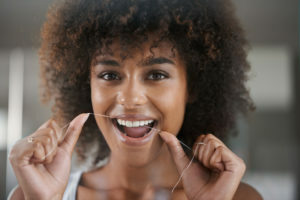 Wear and tear happens over the years and can cause tooth sensitivity, but you can also preserve tooth enamel with the help of your dentist to avoid sensitivity. How can I preserve the protective layer of my teeth? Some of the best ways to protect your tooth enamel is to avoid acidic foods and drinks, starchy foods, and high sugar foods can help keep your enamel strong naturally. Another great way to preserve tooth enamel is to treat your teeth with care. Gently brush your teeth softly, working to massage your teeth and gums rather than scrub your teeth. Finally, you can preserve the strength of your teeth is to only have your teeth whitened by a professional. How can a dental professional help my sensitive teeth? Your dentist can recommend a strong toothpaste that is specifically for sensitive teeth (like Sensodyne) and enriched with fluoride. Your dentist will warn you against tobacco use because it will quickly destroy enamel and catalyzes gum recession. Your dentist can create a custom mouthguard when you sleep to avoid teeth grinding and causing unnecessary wear and tear on your teeth. How can my family dentist help me preserve my tooth enamel? A key part of saving the enamel on your teeth is by following up with your dentist every six months for routine cleanings and dental exams. During your appointment, your dentist will have the opportunity to check on your oral health while deep cleaning harmful materials away. Plus, when you speak to a dentist about your oral health, they can help keep your smile durable over the years by strengthening your enamel with fluoride treatments! Ask your dentist about fluoride and if you’re a good candidate for extra preventive treatments. Here at Region Dental, our dental professionals are passionate about dentistry and helping each of their patients recover from tooth sensitivity. We work to keep your smile strong over the years, optimizing your oral health and maintaining it. Call us today to schedule your next appointment.